The artillery turret is a super-long-range static defense structure added in game version 0.16. It fires artillery shells, relatively slow-moving projectiles that explore chunks of terrain they travel across. The turret has both automatic and manual (even longer-ranged) firing modes. Projectiles have sufficient damage to destroy spawners and any type of worm with a single hit, and have a modest area of effect. Infinitely-stacking research upgrades are available for range and firing speed, but not damage. The artillery wagon is essentially the same weapon, only mounted on a train car and therefore mobile. Artillery turrets have a massive range, outranging other fixed fortifications by a factor of 10 or more. There are no special limits on how many may be built or where and, being ammunition-based, these turrets do not require electric power to operate. In automatic mode, they function much the same as other turrets, automatically scanning for valid targets within range and firing on them. Automatic mode can only target enemy structures (spawners and worms), not mobile units (biters and spitters); shells do, however, damage mobile units in the vicinity of impact normally. In manual mode, an Artillery targeting remote is used to point-and-click anywhere in the world, map, or zoomed-in map; each click corresponds to one shell delivered to that location, so long as any working artillery turrets and / or wagons are in range. Targeting remotes show the number of fire-ready (loaded and, for wagons, stationary) artillery pieces in range of cursor position when held. Manual fire can be ordered on unexplored areas; shells will explore all chunks they travel across (but no surrounding chunks). Range in automatic mode is 224 tiles (7 chunks); in manual mode, 560 tiles (17.5 chunks). Infinite research is available to increase range, at +30% of base range per level, applied to both automatic and manual range. Aside from the considerable expense of research and assembly for both turrets and shells, there are certain considerations that make a base defense based purely on these turrets unwise, despite their phenomenal range. Artillery shelling will antagonize enemy mobile units in the vicinity of the impact into rushing the turret emplacement, regardless of their normal "aggro radius". 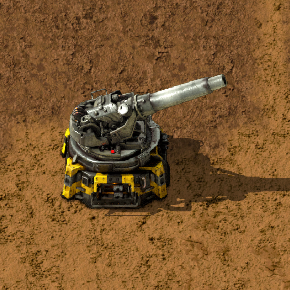 Artillery turrets are relatively slow-firing, although infinite research is available to improve firing speed, at +100% per level, affecting both stationary turrets and wagons and applying to both automatic and manual mode. They also cannot target mobile units in automatic mode. Importantly, artillery has a minimum range as well, which is 32 tiles. Together, these limitations mean that an artillery turret needs to be defended by other means. Any conventional approach such as walls, gun, laser, and / or flamethrower turrets, or the personal intervention of the player will do. However, players should keep in mind that extensive shelling of large biter-infested areas will produce massive attack waves centered on the position of the artillery piece at time of firing, and should plan close-range defenses accordingly. Logistic considerations are also important, as artillery shells have a stack size of 1, meaning any-size container can only hold a modest supply and an inserter will only ever move a single shell at a time. Players may wish to consider on-site assembly for permanent and semi-permanent emplacements. The turret itself can hold 15 shells, and the wagon version can hold a full 100, providing a buffer of some size in the event supply is interrupted.